There’s more to Stockholm than a thriving tech scene and minimalist design. Scandinavia’s most famous archipelago has a wealth of literary history ready to discover. We start our tour with a stop for the whole family, the first of two stops into the magical world of one of Sweden’s most famous authors, Astrid Lindgren. Junibacken, located on the island of Djurgården in the heart of Stockholm, is an interactive museum and play park. The atmosphere is noisy, colorful, and teeming with curiosity, inspiration, discovery and play. Hop on the Story Train for a tour through some of the fairytale worlds Lindgren created, narrated in over fifteen different languages. Open year round, the park provides a variety of entertainment including special theatre presentations, orchestras and other activities. While offering a glimpse into Lindgren’s imagination, Junibacken is best enjoyed with a child in tow. The museum also hosts Sweden’s largest children’s bookshop. For a more subdued look into the famous author’s life, you can visit the apartment where she lived in central Stockholm for over sixty years. Astrid Lindgren (1907-2002) wrote 34 original books and 41 picture books and gave the world such memorable characters as Pippi Långstrump (Pippi Longstocking) and Mio from the tale Mio, min Mio. The apartment turned museum, located on Dalagatan 46, offers tours in Swedish, which you can sign up for by visiting the website. Don’t let the language barrier stop you though. It’s worth a visit no matter which language you speak. Photos are allowed without flash. If your literary tastes run darker and more modern than fairytale worlds and stories about girls who can carry a horse with one hand, I recommend Stieg Larsson’s Millennium Tour. 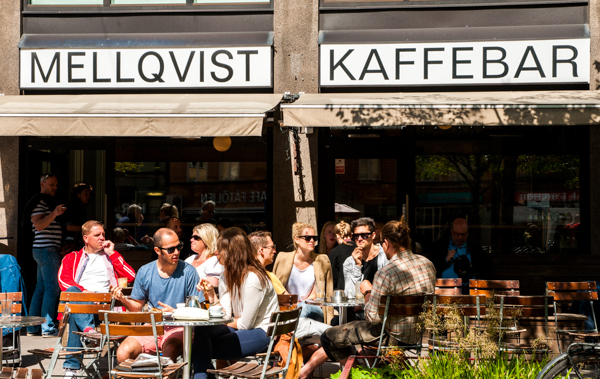 Explore the streets of Stockholm’s notorious Södermalm district, working class turned café-hipster, where you’ll visit not only a few of the places where Larsson wrote the Millenium trilogy, but also the haunts of his characters, including the infamous Mellqvist Kaffebar. Along the tour you’ll receive insight into the inner workings of the political and class climate of Stockholm. After Larsson’s seedier world, step back in time a few decades and visit one of Sweden’s classical novelists. Wander over to Drottningatan 85 and you’ll find the Strindbergsmuseet in a building known as Blå tornet (the Blue Tower). August Strindberg (1849-1912) was a playwright, poet, and novelist who wrote more than 60 plays and 30 pieces of fiction, in addition to autobiographical and philosophical work. Many believe Strindberg was a man of the times, and through his work brought pivotal issues to the table for discussion. He was also known as a man of extremes, accused of misogynistic views at times and at other times cheered for exposing the plight of women, depending on which side of the critiquing table you were on at the time. The museum offers a tour in Swedish which includes a visit to Strindberg’s library on the sixth floor. Again, don’t let the language barrier stop you. While the tour is available only in Swedish, some information is also available in English. I particularly enjoyed reading about his letters he wrote to his children. Before you go, make sure you stop in and view the apartment where he lived the final years of his life. Located just up the hill outside of Blå tornet you’ll find Tegnérlunden park, an idyllic place to wander around, enjoy a picnic, ponder the coffee rituals of Swedes and discover several literary statues. Lindgren’s book Mio, min Mio begins in this park when Bo Vilhelm Olsson meets the genie that takes him to the Land of Faraway. Perhaps it’s fitting that one of the statues located here is a statue of Astrid Lindgren. The other notable statue is Carl Eldh’s statue of August Strindberg, which seemed to captivate me more and more the longer I studied the details on it. When you’re ready to leave the park, head back down to Drottninggatan and you’ll notice strips of words down the center of the street. Sometimes chosen to spark intentional discussion and debate, these citations were selected from a variety of Strindberg’s work and appeared during the first Strindberg festival in 1994. In an effort to prevent the words from fading, in 1998 they were permanently installed into the asphalt with stainless steel. Also known as Bellman Museum, carries a small exhibition on Swedish poet, songwriter and composer Carl Michael Bellman (1740-1795) celebrating his life and work inside a 17th century Stockholm house that was the custom’s market for farmers who wanted to sell their goods to market in Gamla Stan (the old city). The museum is located at Långholmen and attached to the grounds is a café and conference center that can be rented out. The website lists opening hours and a map, along with more information. Our last stop takes us back to the heart of Stockholm to visit the beautiful Stockholm Public Library, because no literary tour can be complete without ending at a convenient place to sit down, relax and open a good book. The building, designed by Swedish architect Gunnar Asplund, officially opened in 1928 and holds more than 2 million volumes, not including audio books. With that many books, you’re bound to find something unexpected. Originally from Atlanta, Georgia, Cas Blomberg currently lives in Stockholm, Sweden where she spends most of her time writing speculative fiction and poetry to forget about the freezing death waiting just outside the door. Her work has been featured in Perihelion Science Fiction, Mused Literary Review, and Page & Spine. She is a member of the Stockholm Writer’s Group and is interested in international literacy programs. You can visit her at http://www.casblomberg.com.